More compact and less obtrusive in the page. An improved Address Book and slick auto-complete behavior. No more tabs – the better for people to find things they recognize at first glance. Today Tim announced that Twitter has been integrated into ShareThis as well. This is fantastic, and obviates the need for the TweetThis buttons that I’ve seen springing up hither and yon. 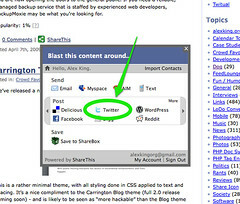 If you’ve customized the order of services for ShareThis on your site, you may want to move Twitter up the list like I did. It’s great to see ShareThis doing so well, and it’s a treat for the team and I at Crowd Favorite to be able to work with the great folks on the ShareThis team. Iv just add Twitter to my ShareThis. Twitter has to be in the top 5 social sites if not higher.